Today we have a cool and fun collection of 4 Dragon Images! Free for you to use. Featured below is a magnificent Black and White Dragon WeatherVane picture. The detail of this one is truly amazing. 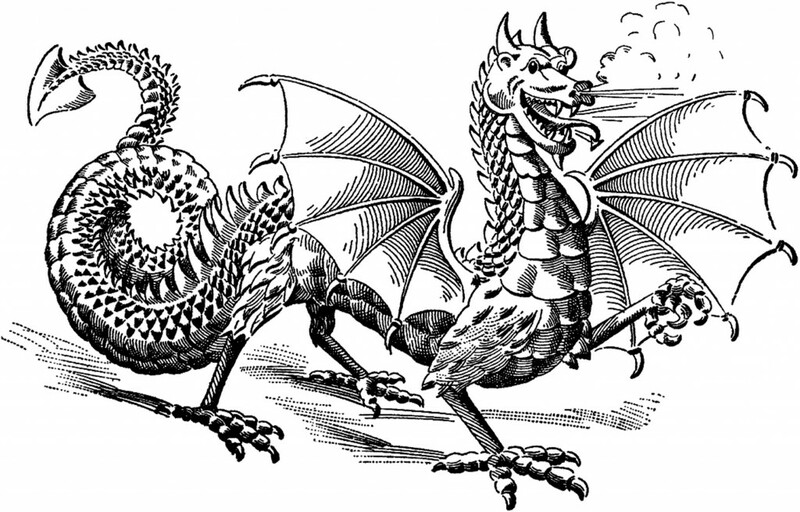 We also have included two fire Breathing Dragon illustrations. Both are so fierce. Be sure to look at the intricate details of these animals. Another one is the dazzlingly beautiful full color Natural History print of a Dragon with Wings. Our Dragon graphics are great for your Junk Journal or Mixed Media Projects! Pictured here is a Dragon WeatherVane Image! This Vintage Engraving was scanned from a Rare Antique, Circa 1898 Architectural Metal Company Catalog. In addition to the Dragon, there appears to perhaps be an image of the sun with a face. A tremendous amount of skill and patience most certainly would have been necessary to create this amazing work of art! This is such an unusual looking WeatherVane. I have never seen one like this before! I’m sure it would be quite a rare piece if you could find one today! Featured above is a Free Dragon Clip Art Image! 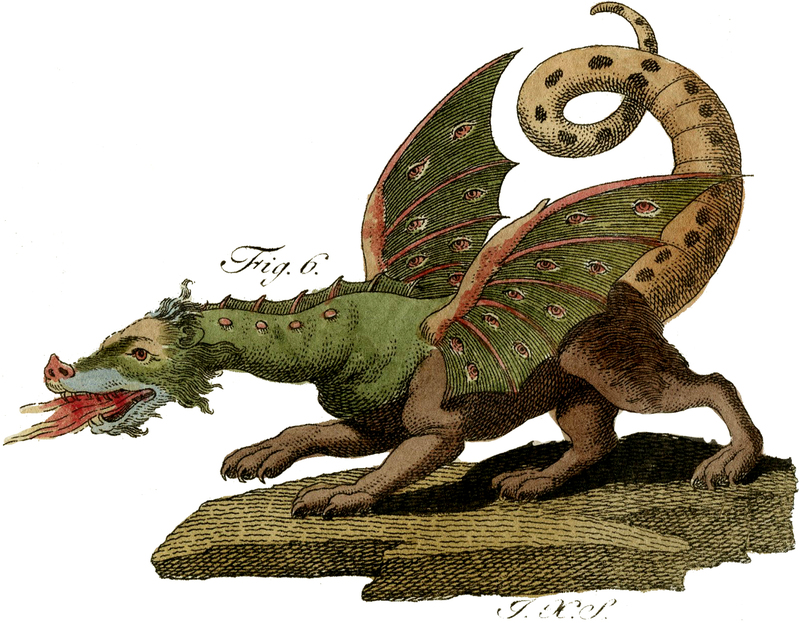 This fabulous Mythical creature is a classic looking Fire Breathing Dragon! He has the scales, wings, and a long pointy tail; exactly what you would expect a real Dragon to have! He is really quite ferocious looking! This one was scanned from a Circa 1896 Design book filled with all sorts of fabulous illustrations! I think that it would be so much fun to imagine how he should look and then color him in! Here is another fabulous Vintage Dragon Image!! Shown above is a Black and White Silhouette Illustration of a very fierce looking Dragon! 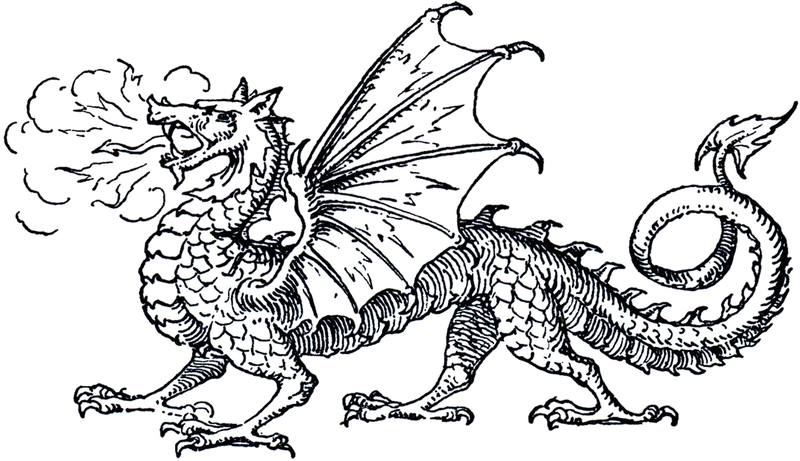 Similarly, he has scales, wings, and a pointy tail like the previous Dragon image. He even has smoke coming out of his nostrils! He appears to be really angry about something! This one was scanned from an Antique Design book. I’m so excited to share this one with you guys!! This is a fabulous, and rare, Fire Breathing Dragon Image!! This offering was scanned from a very rare and early Circa 1790’s, German Natural History Print/Page in my collection! I researched and located the set of books that this came from, hoping that I could purchase them. However, the cost was $15,000!! Yikes! Needless to say I didn’t buy them, but I feel really blessed to have acquired a few pages at least! This ferocious looking Beast has a huge curly tail and large Bat like Wings with eye shaped patterns on them! He looks real enough to be utterly frightening I would say!! I hope you enjoyed this fun curated collection of 4 Dragon Images!! You might also like our 75+ Best Free Vintage Halloween Images HERE. Vintage Pegasus Horse Image! Public Domain Phoenix Image – Rare! Lady Flying on Bird Image – Marvelous! Now how kewl is that Dragon – wow, rare, oh my yes. Thank you so very much for sharing this. Love this guy! Thank you. I love this guy! He reminds me of the “luck dragon” in “Neverending Story”. Yes, you are right Vix! Such a great movie! I love this fire breathing guy. I just know he’s a nice dragon. thanks, your images are Amazing! I really love the dragon and lion images! Thank you Laura, so happy you enjoy them!